We are pleased to announce that another live Tara’s Triple Excellence weekend retreat will be offered June 27-28, 2015 at Blazing Wisdom Institute in Saugerties, NY. The emphasis at this retreat will be on the Tara sadhana practiced worldwide by the Shedrub/Gomde communities, monasteries and nunneries, with instruction on the meaning, method of practice, and melodies for recitation. 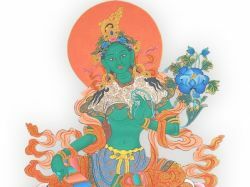 In addition, we wish to launch a Tara mantra accumulation, affording everyone an opportunity (whether they attend the retreat or not) to dedicate mantras for the longevity and health of our lineage teachers, and a swift and effective recovery from the ongoing disaster in Nepal. Anyone who has received the necessary transmissions for Tara practice from any of our lineage teachers is welcome to register for the retreat weekend. Enrollment in the TTE online course is not a prerequisite, nor is completion of the first two excellence levels for those who are enrolled, nor attendance at previous TTE weekends. After this program, we plan to offer regular bi-weekly online practice and discussion sessions of the sadhana, and to launch the mantra accumulation.